We all know how important curb appeal is. The exterior of your home is the first thing a prospective buyer is going to see, so it’s important that you make a great first impression when you’re trying to sell your home in the winter. Unfortunately, the cold, dark winter makes it hard for prospective buyers to see the exterior of your home without some help. Amp up your curb appeal by lighting up your home! Repurpose your holiday lights to help lend some sparkle to your home. Classic soft white lights wrapped around a porch railing or draped inside front-facing windows give your home some sparkle in the dim winter months. If you put electric candles in your windows, consider leaving them up through the spring to welcome evening visitors to your home. Creative outdoor lighting options include landscape lighting and uplighting, both of which can highlight features on your home that might otherwise get lost in the dark. And of course, lighting does more than improve curb appeal. It can also improve safety. Make sure you’re replacing burnt-out bulbs and ensuring that lighting fixtures don’t get covered in snow. While you may despair over the lack of green in your lawn this time of year, try adding some green to your porch with small evergreen trees or shrubs. A large planter or two with gorgeous evergreens gives some life to your porch, even in the dead of winter. If you live in a more temperate zone, consider using some winter-friendly plants, like calendulas or pansies, to add some color to your lawn. Mulch flower beds and shrubs, and care for your lawn throughout winter much like you would in spring and summer. It’s extra-important to attend to outdoor safety concerns when selling your home in the winter. Icy steps and less light are a dangerous combination! Here are a few ways to make sure your home’s exterior is welcoming and safe. Nothing makes a worse first impression than trudging through snow to get to the front door. If you’re selling your home this winter, make sure you always keep a clear path to the front door. Otherwise, a prospective buyer may spend their first few moments imagining how much snow they’ll have to shovel each year! Icy walks and stairs should be completely cleared or treated. While you’re removing ice and snow from those stairs, test the railings to make sure they’re still safe and secure. Over time, railings can come loose and become unsafe. The gray winter is the perfect opportunity to add some color and flash to the front of your porch. Consider repainting your front door with a bright, fresh hue to add a spot of color. While you’re focusing on the door, swap out your old, faded house numbers for a punchier version. Select big, bold numerals so homebuyers can easily find your front door. Finally, consider a wintry wreath or other neutral door decoration. This can be a place to add additional greenery with an evergreen or herb wreath, or a place to add subtle sparkle to catch potential homebuyers’ attention. Winter doesn’t have to mean a boring, blah home exterior. 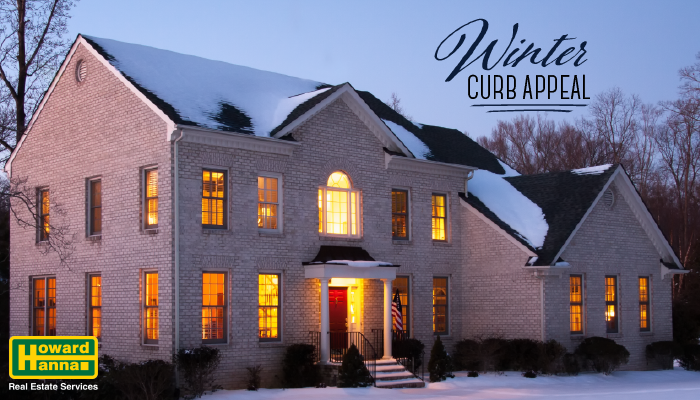 Create an experience that draws homebuyers in by using these tips to improve your home’s curb appeal in the winter. Are you thinking about selling your home this winter? Find out what your home is really worth with a free home valuation. Then, learn more about our exclusive seller resources that help you sell your home faster, easier, and for more money.